As data rates trend upward, electronic OEM design engineers need new strategies to push the speed-density envelope of backplane interconnects, without degrading signal integrity. 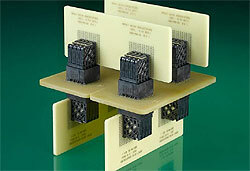 Data transmission magnify over longer links in backplanes, cables and PCB materials. High-speed networks typically require closely-coupled high-speed links, which are prone to noise, cross-talk and signal degradation. Signal integrity is paramount to reliable performance, which makes it vital that designers prevail in specifying the best solutions. High-speed backplane connectors continue to be in great demand supporting next-generation product development in the telecommunication, data networking, data storage, medical diagnostics, and other market sectors. Backplane connectors link several connectors in parallel, so that each set of pins on one connector interlinks with a corresponding set of pins on each of the other connectors—providing a “backbone” to connect several PCB cards together to make up a complete system. Selecting the right backplane connector for a particular application can be challenging. Minimally, selection and specification criteria include density, data rate options, physical size, number of differential pairs, component reliability and modularization, and low applied cost. Also important is backward and forward compatibility, to ensure support of future speed upgrades, without costly architecture redesign. Keeping pace with demand, connector manufacturers are helping designers make the right choice with innovative backplane connector designs to reduce channel length and improve signal transmission performance in high-speed, application-rich electronics. A prime example of an innovative, non-traditional approach is the introduction of orthogonal and orthogonal direct (midplane) connector designs, which allow OEMs to place more system boards within a compact mechanical chassis. Orthogonal backplane solutions are also emerging in switch, server and storage applications to improve channel performance and lower costs. Orthogonal midplane connector systems offer broad-edge-coupled transmission, with vertical add-in cards on one side of a midplane can be connected to horizontal add-in cards on the opposite side, allowing the PCBs to mate orthogonally. The technology enables denser system architecture and can be deployed in high-density applications where standard backplane connections are difficult to implement due to space limitations and airflow constraints. The latest orthogonal connector architectures incorporate design improvements, such as utilization of smaller compliant pins that lower mating force and improve the signal launch off the PCB. This design tweak improves performance at high-speed channel bandwidths and reduces insertion loss, cross-talk, and performance variation across every differential pair within the system. Smaller compliant pins also reduce the “stub” effect and shrink the physical size of drilled holes in the board, improving capacitance and impedance. Mating force is another important design consideration in backplane selection. As more signals are packed into tighter real estate, a low mating force is highly desirable. With high insertion force backplane connectors, it often becomes necessary to consider alternative latching techniques, as well as chassis tolerances (e.g., rails and guides), potentially increasing risk of pin damage. Low insertion force, while maintaining end-of-life normal force, is optimal – and another advantage of orthogonal connector systems. Orthogonal design architecture incorporates a cost-cutting angle for OEMs and their design teams, because it allows the continued use of standard PCB materials, rather than higher end, more expensive materials. This greater density also allows for smaller packaging, which directly addresses customer need for smaller and more environmentally friendly solutions – at a cost-effective price point.